For 21 years, the people of The Gambia lived under the dictatorship of military strongman Yahya Jammeh. Open elections in December 2016 resulting in the success of opposition candidate Adama Barrow brought an end to the tactics of torture, enforced disappearances, murder, sexual assault, and grand larceny used by the Jammeh administration. Now, The Gambia is working to step up to the challenge of unpacking the past, building a brighter future, and ensuring that it never relapses into repression, violence, and exclusion. In December of 2017, the National Assembly passed a bill establishing a Truth, Reconciliation, and Reparations Commission (TRRC) to begin the truth-seeking process. As the Commission moves forward in its mandate and with its newly appointed commissioners, it has urged victims of the Jammeh regime to come out and tell their stories. 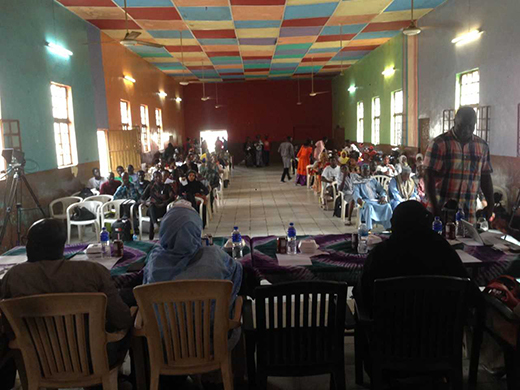 On September 22, the TRRC held its first Town Hall event to engage the public in dialogue about the process of carrying out the truth-seeking mandate, and the opportunities and practical challenges that lie ahead. The ICTJ spoke with Dr. Baba Galleh Jallow and Musu Bakoto Sawo, the Executive Secretary and Deputy Executive Secretary of the TRRC, respectively, to hear their insights about their work and how the TRRC can build upon other efforts to put victims at the forefront of The Gambia’s transformation. ICTJ: What inspired you both to become activists? Dr. Jallow: I started as a journalist. I was the Editor-in-Chief of the Daily Observer, a government paper. But in 1999, I launched an independent newspaper, and then I got into a lot of trouble with the government because of the stories we wrote. I was arrested several times, my parents were arrested, and I was accused of being not Gambian. At some point, I received information that I was going to be deported, so I decided it was better to leave. I fled in September 2000 and went to the U.S. I was in exile for 17 years. Mrs. Sawo: I started working as a child rights advocate when I was about 9 or 10 years old. It was argued then that I didn’t understand a lot of things, but from that age I thought there was a need for me to be active doing something to change lives. Then along the way, at 14, I was married. That was a shocker because the same things I was campaigning against, I became a victim of. It shut me down for a while, but then I realized that, even though I was still young, I was supposed to grow up. I realized that feeling sorry for myself wouldn’t change anything because already people were feeling sorry for me. Going to school was difficult, so I figured I needed to continue doing the things I love. I continued working and campaigning to end female genital mutilation because I’ve also undergone the practice and seeing on a firsthand basis the repercussions that FGM has on women and girls. This is what motivated me to continue working as a social justice activist and campaigning for women and girls generally. ICTJ: The Gambia has acknowledged the need to hold Jammeh accountable for his crimes and avoid relapses into authoritarianism. How did broader transitional justice approaches evolve from this stance? What are some of the mechanisms and processes the country has enabled to take on these issues? Dr Jallow: The idea of having a transitional justice process came out of the presidential campaign by Adama Barrow during the 2016 campaign. They made a promise that when they took power they would institute a transitional justice program. They set up the TRRC and are now setting up the Human Rights Commission and the Constitutional Review Commission. There is also the Commission of Inquiry, investigating Jammeh’s financial crimes. I know the administration is also engaged in security sector reforms and is planning civil service sector reforms. ICTJ: How do these instruments compliment the work of the TRRC? Mrs. Sawo: These groups are just being established, so everyone is still working in isolation. We are hoping that some of the recommendations that would come from the TRRC would be selected for the constitutional review commission’s mandate for a new constitution in The Gambia. We’re also hoping that the Human Rights Commission, which is going to serve as a watchdog as far as accountability for human rights violations, would also consider some of the recommendations that might come from the TRRC and, in that way, we would be able to complement each other’s work. Our partnership is quite essential. If we can devise a strategy for the different mechanisms to come together on these issues, this will also help inform the TRRC’s work. We’re hoping when the TRRC is more fully constituted, the commissioners would be able to create these partnerships and plans where we’re able to complement each other’s efforts. It is essential the TRRC leads to policies and laws to ensure that such atrocities are not committed again by any other regime. ICTJ: Some commentators have pointed out that The Gambia, unlike Sierra Leone or South Africa, never suffered from a civil war or a segregationist state. Why does The Gambia need a truth commission? Dr. Jallow: Some reasons are obvious, some are not. It is obvious that there were lots of human rights violations; we had a very oppressive system. We have a lot of victims; there have been enforced disappearances, torture, and the murder of political opponents. To achieve justice, we must find out the truth about the human rights violations. The not-so-obvious reason, but equally important, is the fact that there are certain systemic and cultural factors that enabled the dictatorship that need to be brought out into the open and discussed, so that we don’t have recurrences. If we prosecute people but we don’t address the systematic cultural causes of the dictatorship, we are likely to slide back into dictatorship at some point. The political culture needs to be transformed to avoid recurrence. That’s the less obvious reason. ICTJ: How can the TRRC address these sensitive socio-culture issues and ensure The Gambia avoids recurrences? Mrs. Sawo: Many people don’t know how they were enablers. Some of these cultural factors, for instance where a president is regarded as a king, mean that by doing that, you’re sort of solidifying someone’s position and turning them into a dictator. So for us, what’s important is that we’re going to engage in community outreach or sensitization, hoping to change the political culture as far as these systematic issues are concerned. We must reconcile that there are some people who may be a victim now, but was once a perpetrator, or that someone who was victimized became a perpetrator. We must create a balance so that justice is served to the victims, because they remain the priority. But as far as openly discussing some of the other systematic issues, we want to see civil education to ensure that people are more informed about some of these issues and would be able to perhaps apply them in future contexts. ICTJ: How can the TRRC engage with communities, especially those who have been most victimized, on these sensitive issues? Dr. Jallow: Some communities are very interested in the TRRC and know the process, but there are a large number of people who don’t know about the TRRC or even what transitional justice is. That’s why we have a community outreach unit and why we’ll have reconciliation officers who will be going upcountry. We’ll also have regional offices, not only for the possibility of holding regional hearings, but also the possibility of sensitizing the local communities. Another idea they’re going with is to have community sensitization agents within rural areas, so they can go around and talk to people about the TRRC. Right now, in terms of outreach, we are developing a memorandum of understanding with the victims center. We’ve worked very closely with them to address the reparations question, for example. There are children at risk of dropping out of school, so with the victims center we’re working to set up a scholarship scheme that would help students who lost their parents to the dictatorship to continue going to school. I have meetings with school principals across the country to discuss how best to expand transitional justice in their schools. It’s an ongoing process, and we have developed some new positions dedicated to making sure we have effective community engagement across the country. Mrs. Sawo: We will also have dedicated services for women, for example. In partnership with donors, we are implementing women’s listening circles, as well as sexual and gender violence trainings with women’s peer to peer support groups. We’re also embarking on a range of programs that are sensitizing communities generally about issues of sexual violence and how it is not the fault of the victims, but rather that of the perpetrator. When you are a victim of sexual violence here in The Gambia, it is not the perpetrators who are held accountable, but rather the women who have undergone these horrific experiences who are blamed. So we’re also trying to change people’s perspectives and mindsets in relation to that. The TRRC will address some of these sensitive issues, so we want to prepare the public for some of these issues they will be faced with. ICTJ: What are some of the challenges in pursuing this broad-based program? Mrs. Sawo: I think we should be very cautious when dealing with women’s issues. We can’t have statement takers interview women who have suffered sexual violence, open up their wounds, and leave [the women] there. We need to figure out a mechanism that we can put in place to create that trust and also allow those women victims to know that they are not alone, that there are other people with similar stories, so they can find support in those other women who have also undergone similar circumstances. We should provide them with counseling, so they do not feel that they are alone, so they do not hurt any more than they already have, and to ensure we do not retraumatize them in the process of taking the statements. We have so many competent young people in this country who can take it to another level. But you cannot only mobilize young people if you don’t trust these young people enough to give them leadership positions. I believe in involving everyone, making people understand this is what transitional justice means; these are its mandates – not just gathering them and speaking to them, but involving them fully in the process. While I think we could have more women at all levels of the process, I’m happy that we have quite a number of young people involved in the administrative work of the TRRC. Dr. Jallow: Beyond these important issues, another challenge is funding, especially regarding the reparations program. Also, there is still some support for Yahya Jammeh in this country. We sometimes get pushback from his supporters on social media and publications in the media. It takes a lot to be able to just focus…whenever I have the opportunity, I say failure is not an option. We must make sure dictatorship never happens again here.